Another Sabres season started with a dud as the Montreal Canadiens left Key Bank Center with a 4-1 win last night. Just over 24 hours after losing Jack Eichel for an extended period, Evander Kane left the arena on a stretcher and the Sabres were beaten up and down the ice by their division rivals. 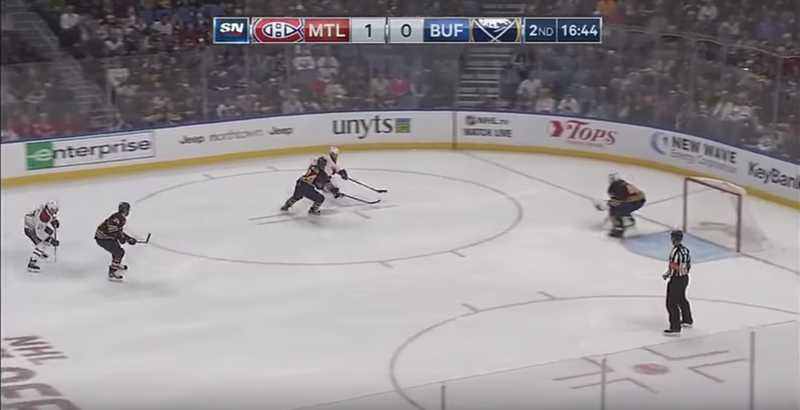 As part of a new installment this season, I’ll take a look at the goals scored against the Sabres – and sometimes scored by the Sabres – from a goalie’s perspective. The idea is to identify potential reads and expectations for the Sabres goaltenders on goals that would otherwise be categorized as weak or bad. Part of my motivation is to simply add to an otherwise one-sided conversation for fans who are otherwise unfamiliar with the nuances of the position. Additionally, the general outlook for the Sabres this season hinged on whether or not the goaltending could carry the load. After allowing four goals in the opener, it’s easy to form concern over Lehner’s play. Although his play last night was certainly better than the four goals and 20-save performance he turned in. 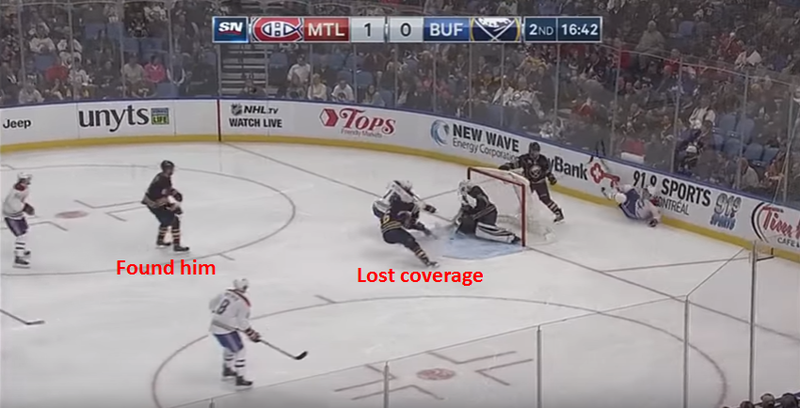 Lehner played in control the entire night and wasn’t stuck out of position or behind the play in any instance. While the first goal, despite the poor gap control from Josh Gorges and eventual high screen, was one that needed to be stopped. A shot from outside the circles on a one-on-one needs to be turned aside even with a late screen as occurred last night. The same could be said of the fourth goal as Lehner had the puck sneak under his arm before it eventually trickled over the line. However, the defensive coverage on the play was so bad it’s hard to point one finger at Lehner despite the leaky nature of the goal. Montreal’s third goal was easily forgivable as nearly any redirect goal should typically absolve the goaltender from responsibility. That leaves us with one goal where Lehner should carry no responsibility, one he should have stopped and another somewhere in the middle with perhaps a bit more blame laying at the feet of the Buffalo goaltender. The goal I’m leaving out is the second, which was an awkward goalmouth chip in that almost assuredly has drawn ire from armchair goaltending experts from around WNY. After Cody Franson’s pinch was beaten with a chip, the Sabres aren’t in bad shape. Franson is behind the play but Casey Nelson read the play properly and bailed. He’s ready to engage Byron and the puck while Matt Moulson has Torrey Mitchell on his hip. 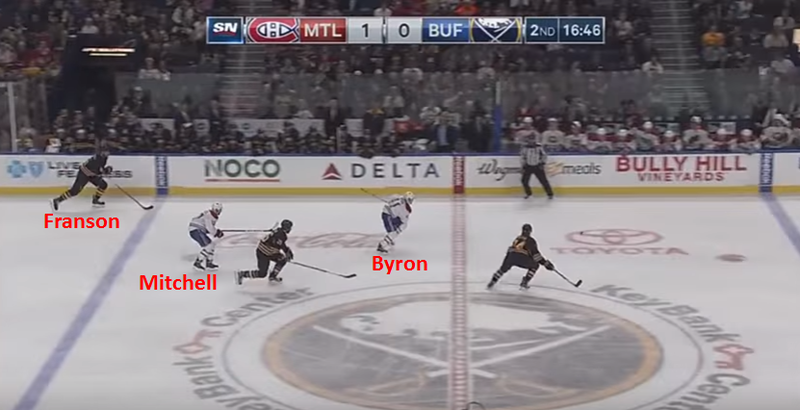 Things still look okay for the Sabres as Moulson has the ability to take body position away from Mitchell and Nelson is pushing Byron away from a quality scoring position. Franson is out of the frame but one would presume he’ll be re-entering as he hustles back after his pinch. Here’s where things start to really develop. Franson is still out of frame, which is only bad news as this point. Moulson is right on Mitchell’s hip and is prepared to lock him up, at this point he is in good position and at a defensive advantage. 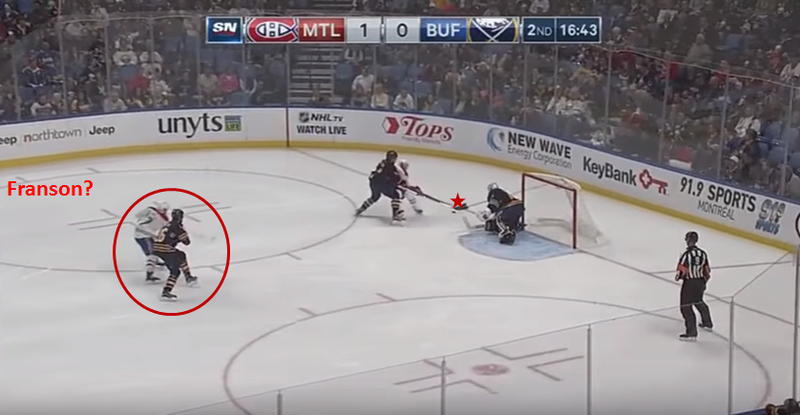 Lehner, having seen the position of the trailer and his backchecker can commit to the puck carrier, who is quickly being eliminated by the defenseman. Nelson continues to close off Byron and Lehner goes RVH to eliminate any short-side stuff attempt from Byron. He can do this with confidence as there’s no threat of a back-door pass or centering attempt as he would have previously read Moulson’s position on Mitchell. Then it all goes to hell. Nelson completely eliminates Byron from the play, but as the two pass the net, Nelson’s skate pulls Lehner’s stick out of position allowing the puck to come off the side of the net or Lehner’s pads at an odd angle. Meanwhile, Moulson has either been caught watching or simply fell asleep on the speedier Mitchell who pounces on the loose puck for an easy tally. The good news? Cody Franson found his way back to the house, although his impact on this play would have been minimal even if he had caught Moulson and Mitchell. Here’s an alternative angle of where things went bad for Nelson and Lehner. They had both done a fine job of shutting down Byron and eliminating any threat on the play. Despite the snow you can make out Lehner’s arm turning out as Byron and Nelson pull his stick away from his pads. 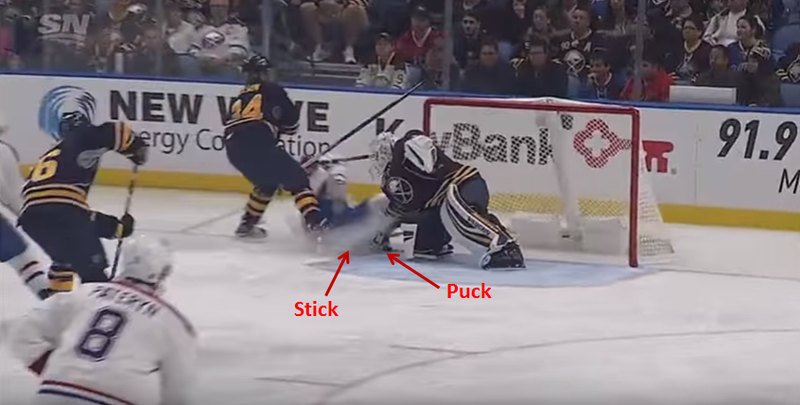 Meanwhile the puck is between his hand and his pad, which eventually causes the bad bonce that pushes the puck to the crease instead of under Lehner’s right hand for a whistle. What I want to point out here is the general unlucky nature of this play. Nine times out of ten Lehner’s stick and blocker aren’t pulled away from his body and he simply clamps the puck for a whistle. Worst case scenario, the puck gets pushed to the corner or winds up under Byron as he’s falling. In this case (a worse-worse case scenario) Lehner is victimized by a bit of bad luck and the puck ends up in the net. Of course, none of that matters if Moulson maintains coverage too. If he doesn’t lose the man he’s skating ahead of or next to for most of the ice surface, this goal probably isn’t scored. At no point in this sequence did Lehner lose his technique or read on the play. He would have seen Moulson covering Mitchell and would have known Nelson wasn’t going to lose Byron as he pushed to the crease. This means there was no risk of Byron crossing Lehner’s face for a tuck on the far side, nor would Lehner need to worry about a pass. Call it weak if you want, but there was far more to this goal than meets the eye on first diagnosis.